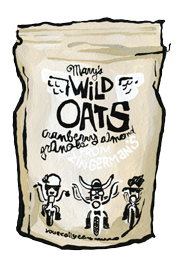 Mary's Wild Oats Granola for sale. Buy online at Zingerman's Mail Order. Gourmet Gifts. Food Gifts. With cranberry and toasted almonds—a breakfast bombshell. Granted, there are probably a few thousand brands of granola on the market. You might even have tried several hundred of them. Why make another? Because the best granolas are a fresh product with a relatively restricted shelf life. Much of what’s out there sits on shelves for months and lacks the full flavor we enjoy. Mary’s Wild Oats, on the other hand, is made fresh every week at our Bakehouse. Named for one of our original bakers, this granola is made with organic rolled oats, real butter, clover honey and plenty of dried cranberries and toasted almonds. It’s a surefire way to bring more flavor to your breakfast table, we guarantee it. Attention long term fans! It's with heavy heart that we inform you Mary's Wild Oats has taken its last bow. If you're looking for a new granola to fall in love with, try Lucy's Extra Seedy Granola from Maine or Farmhand's Choice Granola from Early Bird Granola in Brooklyn, NY.